CRM Fund—After budget transfer/update, the new budget posting is not shown in the Fund page. The user approves a budget transfer, or process a budget update for a Fund. After that, you find the amount for fund has been changed, but the new budget transaction doens’t appear in Budget Posting block. You have checked the back-end in table CRMD_FM_FPO_ITEM, CRMD_FMBPO_AV and found the new posting item has been generated successfully. This behavior is due to the design of the reporting framework for fund postings. The displayed budget postings are fetched from table CRMD_FMBPO_AV. Normally, the default value for the max hits is set as 100, and the header guids of displayed budget postings are fetched from those 100 entries. 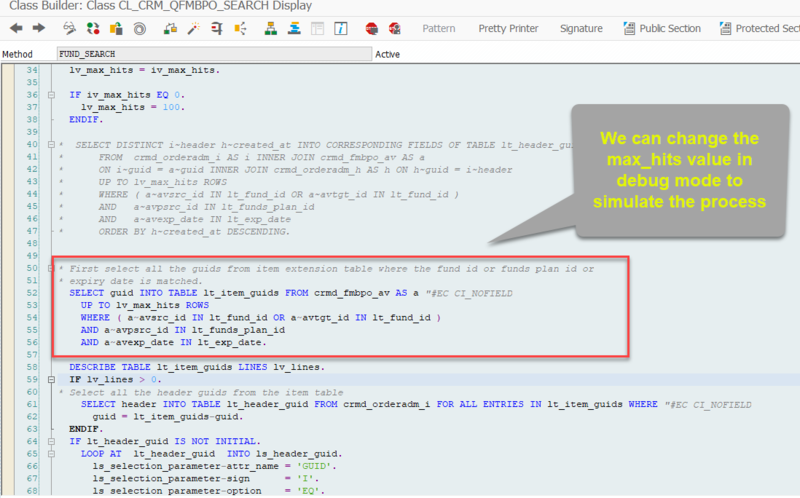 The design logic can be found in method: FUND_SEARCH CL_CRM_QFMBPO_SEARCH. Since there are more budget postings in the fund, the new created budget postings will not be displayed. Besides, if any budget posting has more than 1 budget posting item, the header is only returned once. Therefore it may get less than 100 budget postings although there have 100 budget posting items. Go to UI Component Workbench and increase the max displayed value for view CRM_FM_BPO_AB/BPOVIEW to the expected value. It will make system always fetch the most recent documents from database and return them into the assignment block. Hopes this blog will be helpful for you.